Lovell Homes followed their instincts and explored new methods to find a more efficient roofing solution to meet the growing demand for their ‘room in roof’ house types. 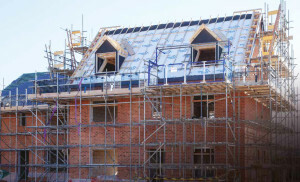 Lovell Homes previously used traditional methods in the construction of its three storey homes, in a process involving masonry gables, attic trusses and hand-cut pediments. This process required a time allocation of up to four weeks in the build schedule, due to involvement of multiple sub-contracted trades and service suppliers. Maintaining maximum site safety was a concern, due to the extensive working at height plus the risk of collapse of masonry gable walls during installation. Mitigation methods for these safety issues required the use of both internal and external scaffolding with associated costs. Lovell was interested in alternative build methods which could simplify the roof construction and enhance onsite safety, whilst saving time in the build plan. Smartroof is a radically different solution which is produced offsite and was installed on these two sets of semi’s at Lovells’ Heath Farm site in just two days, saving weeks from the previous build schedule. This patented NHBC approved system replaced the internal block gable with a pre-insulated timber frame spandrel panel, which effectively removed the risk of collapsing masonry. The self-spanning panels replaced the purlins and ridge beam to create an internal space completely free from structural intrusions. The Smartroof ‘room in roof’ solution delivered benefits; in terms of site safety, thermal performance, consistent quality and speed of construction. 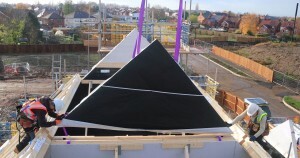 As an alternative to the attic trusses, Smartroof delivered factory assembled roof panels directly to site where they were craned safely into position and are supported by the spandrels. This process removed the need for internal birds’ nest scaffolding, traditionally required for safe working on attic trusses and the pediment roof can be safely constructed over the Smartroof panels. Excellent build quality and thermal performance for the roof was assured as the insulation materials and vapour control layer were applied in controlled factory conditions and were therefore unaffected by any adverse conditions onsite. Since all Smartroof components were delivered to site for cranage on the same day, considerable cost savings were made compared to the traditional build scenario which required multiple cranes and the additional site management issues. This solution also delivered additional benefits to Lovells; as Smartroof also provided the crane lift plan and crane lift plan drawing, together with a CPCS qualified team, consisting of an operator, supervisor and slinger banksman. The Eaves to Ridge Smartroof system is a panelised cassette system which spans from the eaves to the ridge. This type of roof is typically used where the span from gable to gable is greater than 5.4m. The Eaves to Ridge roof includes a box beam, or steel beam, running from gable to gable, which the panels are connected to via a unique engineered patented bracket system, to aid speed of installation. This roof, similar to the gable to gable panels, can also be designed to achieve U-values required by the house builder. The spandrel pockets on which the box or steel beam sit are completely sealed after installation, to ensure no visible air gaps to satisfy room in roof U-value requirements.